Hesperidin holds potential in treating age-related macular degeneration, cataract and diabetic retinopathy. 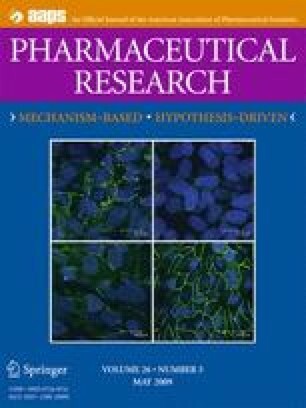 The aim of this study, constituting the first step towards efficient ocular delivery of hesperidin, was to determine its physicochemical properties and in vitro ocular tissue permeability. pH dependent aqueous solubility and stability were investigated following standard protocols. Permeability of hesperidin across excised rabbit cornea, sclera, and sclera plus retinal pigmented epithelium (RPE) was determined using a side-bi-side diffusion apparatus. Hesperidin demonstrated poor, pH independent, aqueous solubility. Solubility improved dramatically in the presence of 2-hydroxypropyl-beta-cyclodextrin (HP-β-CD) and the results supported 1:1 complex formation. Solutions were stable in the pH and temperature (25, 40°C) conditions tested, except for samples stored at pH 9. Transcorneal permeability in the apical-basal and basal-apical directions was 1.11 ± 0.86 × 10−6 and 1.16 ± 0.05 × 10−6 cm/s, respectively. The scleral tissue was more permeable (10.2 ± 2.1 × 10−6 cm/s). However, permeability across sclera/choroid/RPE in the sclera to retina and retina to sclera direction was 0.82 ± 0.69 × 10−6, 1.52 ± 0.78 × 10−6 cm/s, respectively, demonstrating the barrier properties of the RPE. Our results suggest that stable ophthalmic solutions of hesperidin can be prepared and that hesperidin can efficiently permeate across the corneal tissue. Further investigation into its penetration into the back-of-the eye ocular tissues is warranted. This project was supported by NIH grant numbers P20RR021929, from the National Center for Research Resources, and EY018426-01 from the National Eye Institute. The content is solely the responsibility of the authors and does not necessarily represent the official views of the National Center for Research Resources or the National Eye Institute, National Institutes of Health.